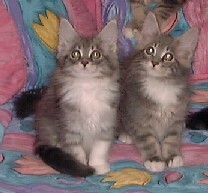 Two blue-silver classic tabby and white females, "Stella" (Pinecoon's Stella of Guardian Angel) and "Twinkle". 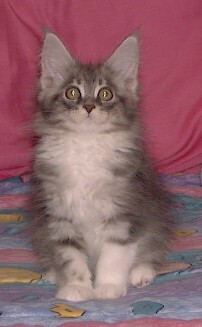 One blue classic tabby male, "Glimmer"
Left to right, they are Twinkle, Sparkle, Stella (in front), Glimmer, Luna and Glitter. 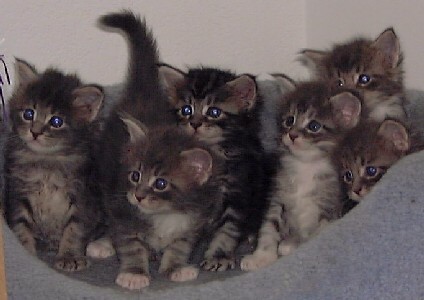 And here are all six kittens at about 4 weeks of age. 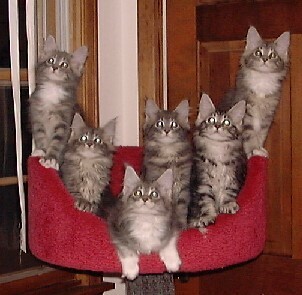 Left to right, they are Glimmer, Twinkle, Luna, Stella, Glitter (in back) and Sparkle. 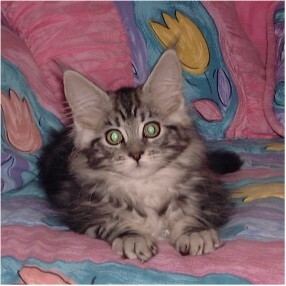 Here are the boys, Glitter and Glimmer, at 12 weeks of age. Stella and Twinkle at 12 weeks. 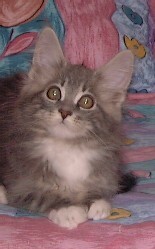 And Luna, who has her own page.